Woohoo Hooniversity is a university in the Beanbean Kingdom that appears in Mario & Luigi: Superstar Saga and its 3DS remake, Mario & Luigi: Superstar Saga + Bowser's Minions, dedicated to the study of laughter. 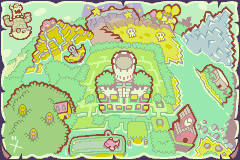 In-game, it is an abandoned, destroyed building with no one but the transformed enemies, and Cackletta and Fawful, when the Mario Bros. arrive, looking for the Beanstar. Cackletta and Fawful take over the university and transform many of its scientists into Laser Snifits. Mario and Luigi soon arrive to stop Cackletta after Prince Peasley mentions that she is there. Once there, they find that Cackletta has locked herself behind a door opened only by light. By positioning certain mirrors, they reroute a beam of light to open the door. When Cackletta activates the Peach-bots that are supposed to contain Princess Peach's voice, however they enrage the Beanstar, crashing it into the university's basement (this is because the voice they stole was actually Birdo's voice). Mario and Luigi arrive shortly after this happens, and Luigi drives Fawful into the ground using his hammer. Mario and Luigi fight and defeat Cackletta, though with Fawful's help, she lives on as a spirit inside his Headgear. Before they finish off the brothers, however, Prince Peasley appears and knocks them out of the university and into Stardust Fields. The brothers promptly go to the basement of the university to collect the Beanstar. However, Popple and Rookie find it first, and prevent them from collecting it. After Popple and Rookie are defeated, a Peach-bot falls down and emits the voice again, causing the Beanstar to fly up into the air and out of Woohoo Hooniversity in rage, with Mario, Luigi, Popple, and Rookie in tow. They all fall off the Beanstar (with Mario and Luigi landing in Oho Oasis, Popple presumably landing in Chucklehuck Woods and Rookie, who remembers who he really is, Bowser, landing in Stardust Fields) before it explodes into four pieces. The inside of the Hooniversity. Cackletta activating the Peach-bots in the Hooniversity's main lab. The door leading to Popple and Rookie's room in the basement. Popple and Rookie encountered at the Hooniversity's basement. Mushroom In the second purple room near the entrance, it's in the ? Block in the southeast. In the first room to the right of the road to the sun door, it's in the northeast ? Block in the north. In the generator service room, it's in the ? Block in the southwest room. In the room before the southwest barrel area, it's in the ? Block in the northeast. In the room in the northwest of the barrel area, it's in the left ? Block above the stairs. Super Mushroom In the first purple room near the entrance, it's in the left ? Block in the northwest. In the room before the southwest barrel area, it's in the ? Block in the southeast. In the room to the north of the purple rooms, it's in the ? Block in the southwest. In the final room to the basement, it's in the ? Block in the northwest. In the fourth room in the snowy basement, it's in the ? Block in the north corner. Nut In the first room to the right of the road to the sun door, it's in the west ? Block in the north. In the first room to the basement area, it's in the ? Block there. Super Nut In the final room to the basement, it's in the ? Block in the southeast. Syrup Jar In the first purple room near the entrance, it's in the right ? Block in the northwest. In the room before the southwest barrel area, it's in the ? Block in the southwest. In the room in the northwest of the barrel area, it's in the center ? Block above the stairs. Supersyrup Jar Outside Woohoo Hooniversity, it's in the southeast ? Block in the northwest of the screen. In the third room in the snowy basement, it's in the ? Block in the southwest. Refreshing Herb In the room in the northwest of the barrel area, it's in the right ? Block above the stairs. Hoo Bean In the second purple room near the entrance, it's in the ? Block in the southwest. In the first room to the right of the road to the sun door, it's in the southeast ? Block in the north. In the room before the southwest barrel area, it's in the ? Block in the northwest. In the room to the north of the purple rooms, it's in the ? Block in the southeast. In the room to the north of the purple rooms, it's in the ? Block in the northeast. Found in hidden blocks (see below). 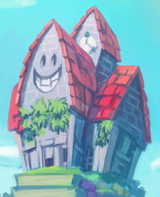 For a list of hidden blocks in Woohoo Hooniversity, see here. For a list of beanholes in Woohoo Hooniversity, see here. Ahaha ahademī Ahaha Ahademy, pun of "ahaha" and "academy". There is a room in the Hooniversity that features blocks from Super Mario Bros., Super Mario World, Super Mario 64, and Paper Mario. This page was last edited on March 26, 2019, at 12:04.